Most “gingerbread” flavored waffle or pancake recipes are not good. 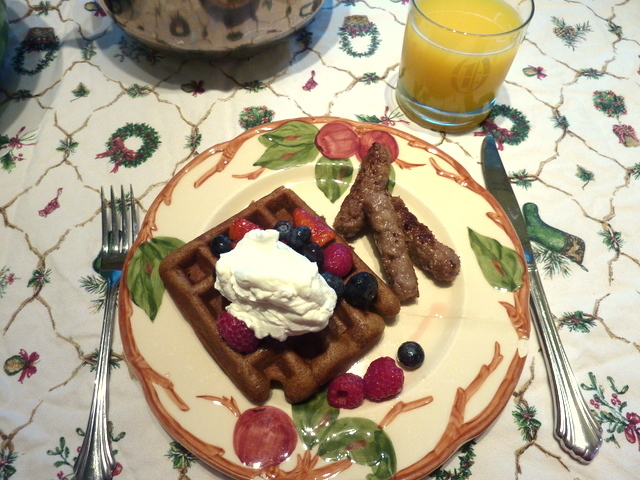 This is because most of them have simply taken regular waffle/pancake batter and added molasses and some spices to it. The extra sugar from the molasses makes the resulting waffle/pancakes too dry and sandy. This recipe, however, has a thicker, moister batter, giving waffles that are cakelike and deeply flavorful. Using buttermilk stops them from being too sweet, and adds complexity to the flavor. Make sure to use a thick Belgian-style waffle maker for these; they become flimsy sad little graham crackers as thin waffles. Whipped cream and sugared berries are a must. In a mixing bowl, beat eggs until light and fluffy, about 2 minutes. Add sugar, molasses, buttermilk, and vanilla and mix well. In a separate bowl, whisk together flour, ginger, cinnamon, cloves, salt, soda, and powder. Add all this to the wet ingredients and stir until smooth. Stir in the butter. You can either cover and refrigerate the batter overnight at this point (it will be very thick in the morning) or cook immediately in a waffle iron, 2-4 minutes. It will makes around 14 big fluffy gingerbready waffles.